WLW/WWE/Pro Wrestling Noah presented a magical week for wrestlers and fans in the Midwest in October. For the past 10 plus years the must attend wrestling weekend in the Midwest has been held in Eldon Missouri at Harley Race’s World League Wrestling Academy. Race is considered by many to be the very best wrestler in the history of the sport. During his time as the 8-time NWA World Champion he would travel across the globe defending the title including the very best in Japan. When his career was done those trips and relationships would help build a relationship with Pro Wrestling Noah, one of the top wrestling companies not only in Japan but around the world. 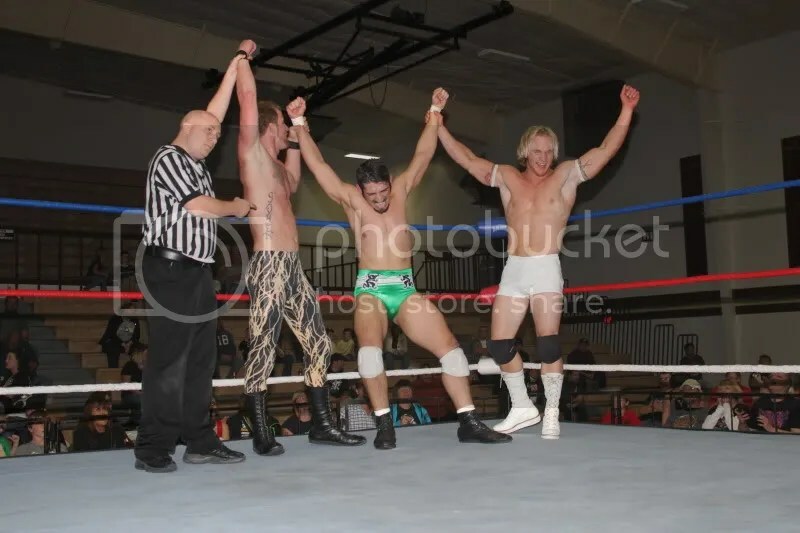 WLW and NOAH would team up to trade talent to allow the best to compete against each other in matches that would prepare one Trevor Murdock to not only be ready to make a run in WWE but flourish with tag team partner Lance Cade to become a 3-time WWE Tag Team Champions. The WLW school would introduce fans to stars like Matt “the Missile” Murphy, Griz, Derek Stone, Trevor Murdock, Wade Chism, the Drill Instructor, Warcloud and Johnny Jett as they mixed it up with many of the top names in the sport like Meng, Butch Reed, Bobby Eaton, The Harris Brothers, Rick Stiener and Japan’s Takeshi Morishima, Takao Ōmori and Go Shiozaki as they toured towns for fundraisers around the Midwest. 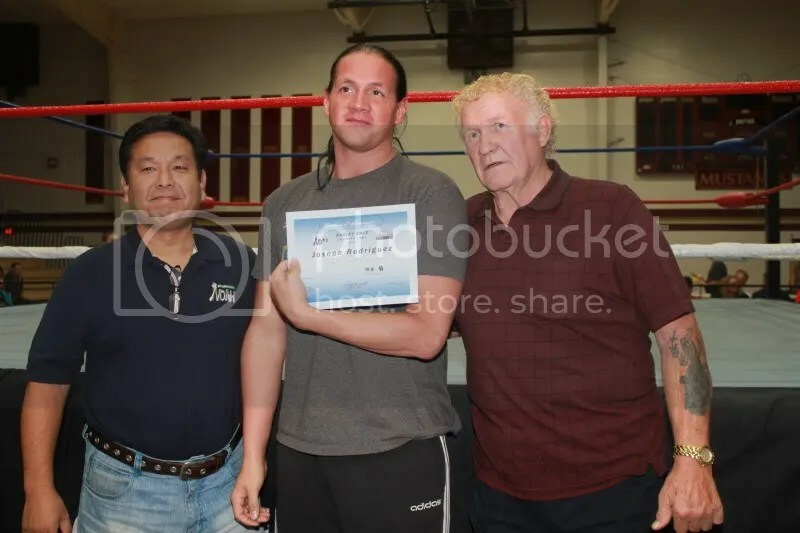 While the school runs year round to season the young talent, the annual WLW/NOAH camp works with WWE as past trainers have been John Laurinaitis, Ricky Steamboat, Tom Pritchard, Takashi Suguira, Go Shiozaki, Takeshi Morishima, KENTA, Naomichi Marufuji, Kenta Kobashi, Ty Bailey, and many more. 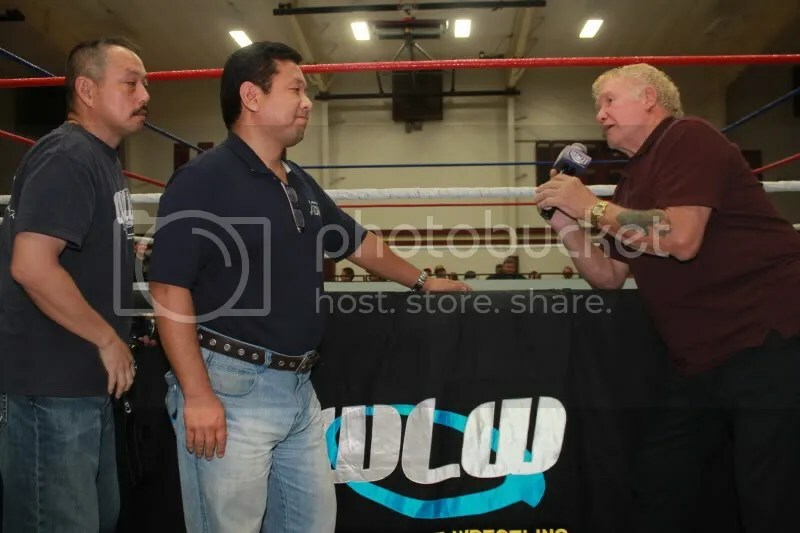 This year’s camp featured Ricky “The Dragon” Steamboat, William Regal, Kevin Von Erich, and Harley Race along with representatives from Pro-Wrestling NOAH Ken Hirayama and Ryu Nakata as students around the country came to hone their wrestling skills in the ring. I was honored to be a guest to sit in during the weeks camp as the 40 plus students took part in the camp. During the days that I was there I was impressed with the patience and dedication that each of the trainers gave each of the students. Due to the size of the groups there were two locations for the students, one for the beginners and one for the more seasoned wrestlers. While each group would be able to get great hints on how to work a match, logic, moves and where to be in the ring with hands on from the trainers. As the camp went on during the week, the Pro Wrestling Noah and WWE representatives wanted to see the wrestlers come up with a match, then perform it in the ring. After the match was done advise was given to each of the wrestlers on what they did right, what they could have done different and how to improve it for the fans. During the Saturday wrestling show I sat down with a few of the students to get their take on the weeklong camp and what they got out of it. 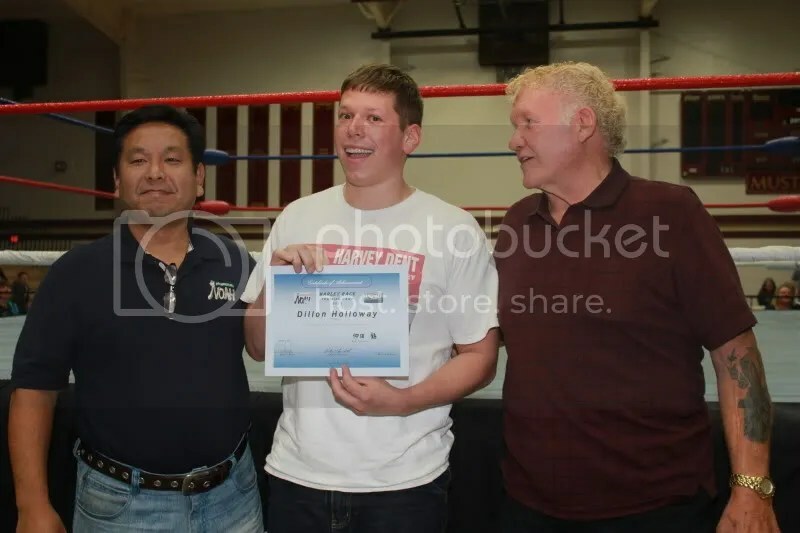 One Jonas Albert Robinson from Oregon had already been to Lance Storms camp and been wrestling since 2008 stated honestly “What I learned this week was that I don’t know anything about wrestling. When I walked through the door I thought I knew about 60% of how to have a great match but in reality it was more close to 5%. The trainers at the camp really opened my eyes on how to improve my game and give the fans their money’s worth when I get in the ring. Then I was amazed at the positivity and information that Kevin (Von Erich) provided. In the end he was such an added bonus with Steamboat and Regal. 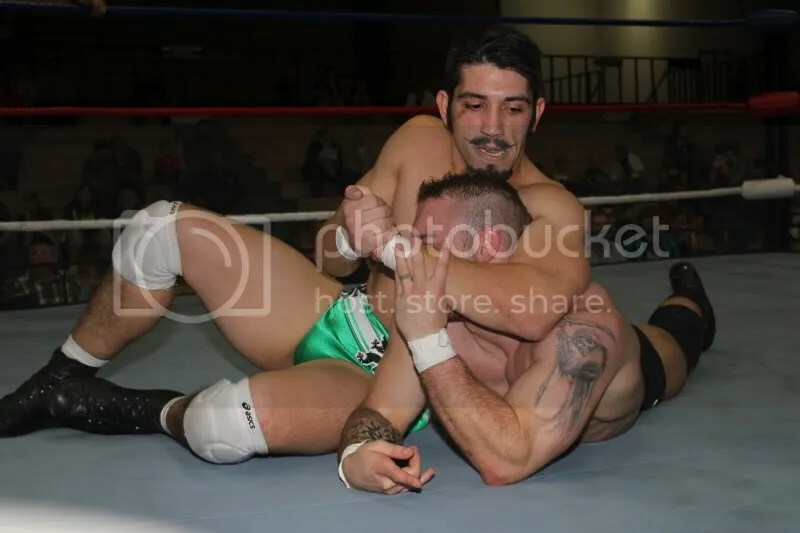 While Jonas have been able to be in the ring prior to the week, Joe Reiling has yet to have a match but knew the importance of getting the proper training and the luxury of having Race’s camp so close to his home in Warrensburg Missouri. 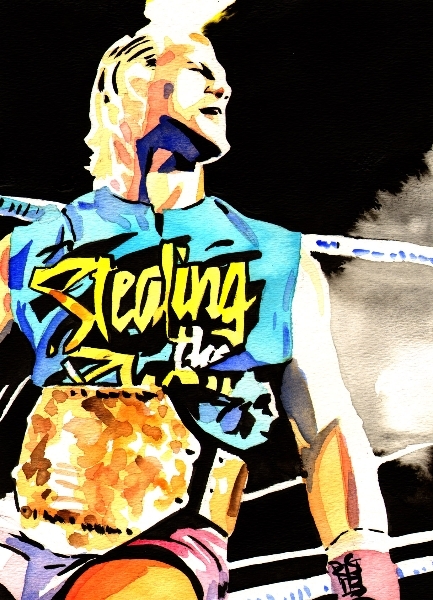 Reiling stepped up the plate when Regal asked for two young men to get in the ring to work the arms. Though his experience was limited he gave a 100 percent and tried to soak in all the information that his trainers were given him. During my conversations with his fellow peers in the camp they relayed to me that he had earned their respect that week and had improved a ton from day one to the final day. 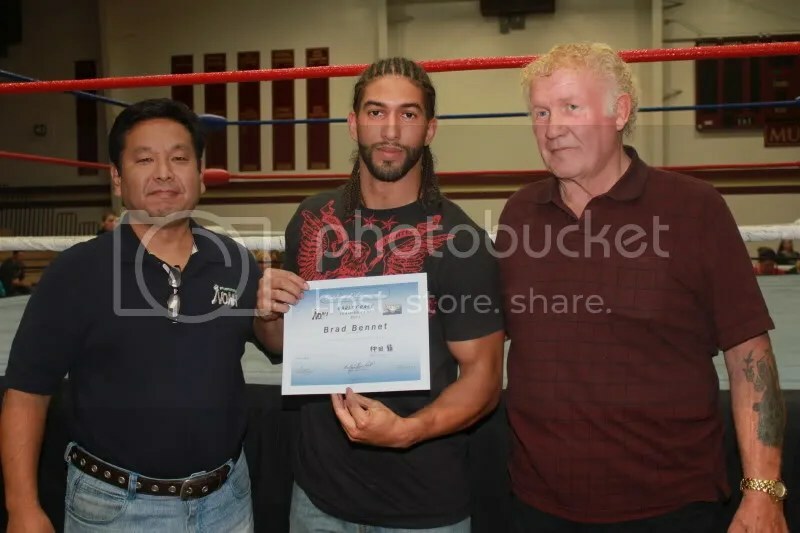 Reiling stated to me that he did not know when his first match would come but the camp added to the fire to learn more to live his dream to be a pro wrestler. I watched another Oregon native Dillon Divine as he worked under the watchful eyes of Steamboat and Regal. I was impressed with his facial expressions and Divine said it best to be when said “You get what you put out of it. So go for it. 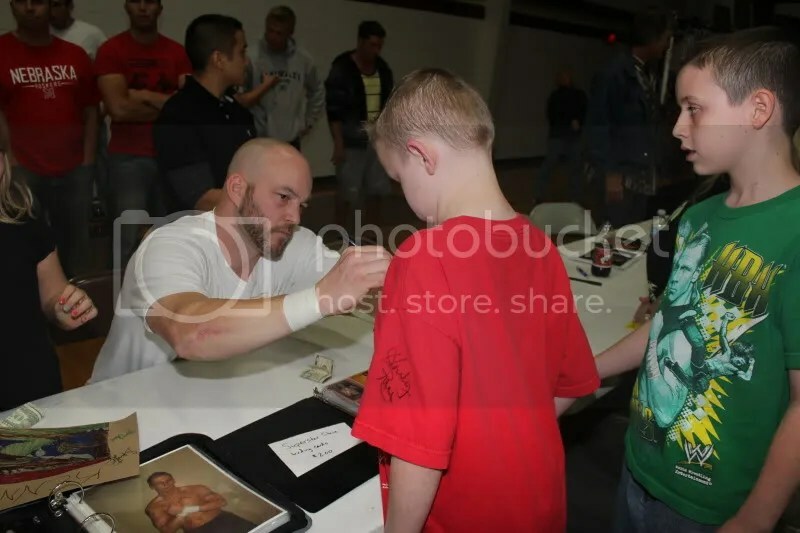 While many of the Harley students took part in the camp one young wrestler fans at MWR are aware of is the 2010 MWR Future Star recipient Sir Bradley Charles. The award is given not only to the wrestler MWR feels has the talent but the dedication and work ethic to become better, to be the best that they can be. SBC had been to Lance Storms camp, wrestled outside the country and is a rising star at Metro Pro Wrestling, 3xwRESTLING , NWA Dynamo and SICW but he once again proved that he is deserving of the award by seeking out more training to be the best that he can be. At the end of the week SBC debuted for WLW as he teamed up on the Saturday show with Lee Walker. & Ethan H.D in a tough loss against the team of Ryan Drago, Jeff Strong, & Dustin Bozworth. Even though SBC did not get the “W” the skills that he learned this week will give him that much more a chance to become a star around the world. In what was one of the most surprising moments for me during the week the students were all smiles as they told me that Regal had invited them to his hotel room on the final night to discuss wrestling in a special Q and A on the week’s events, his opinions and stories from one of the most traveled wrestlers from the past twenty years. What an invitation from a man who could of easily of stayed to himself during a time that he was not required to but instead respects the sport so much that he wanted to give back to the students who took the opportunity to take part in the camp. To say that with that bit of information from the students didn’t move Regal up on my favorites of all time would be a lie. The week would not be complete as WLW would bring the action and love to the fans. A great night of wrestling as always added with a request from Regal to actually wrestle on the card. 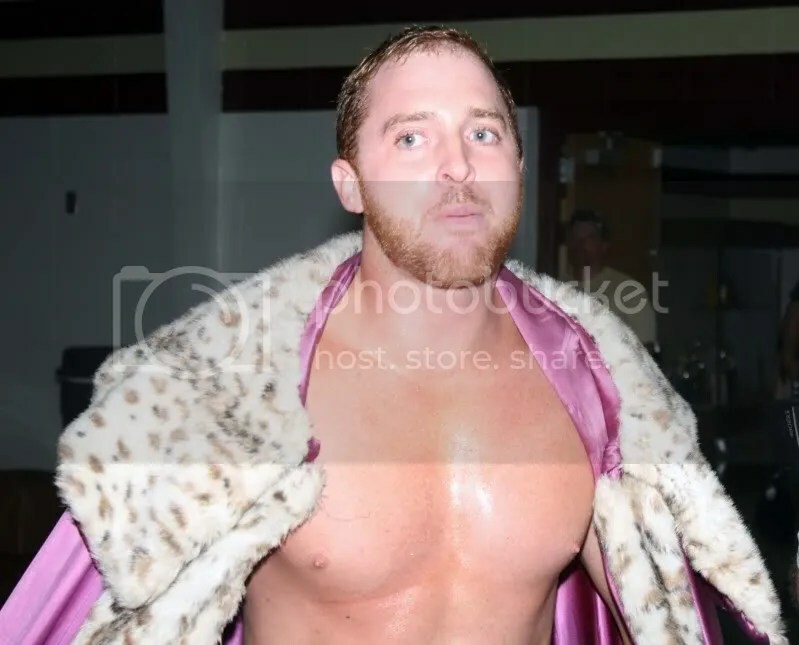 His opponent former WLW wrestler who has worked at WWE and ROH as well as a two time WLW Tag team champion with Matt Murphy and Superstar Steve Fender respectably. 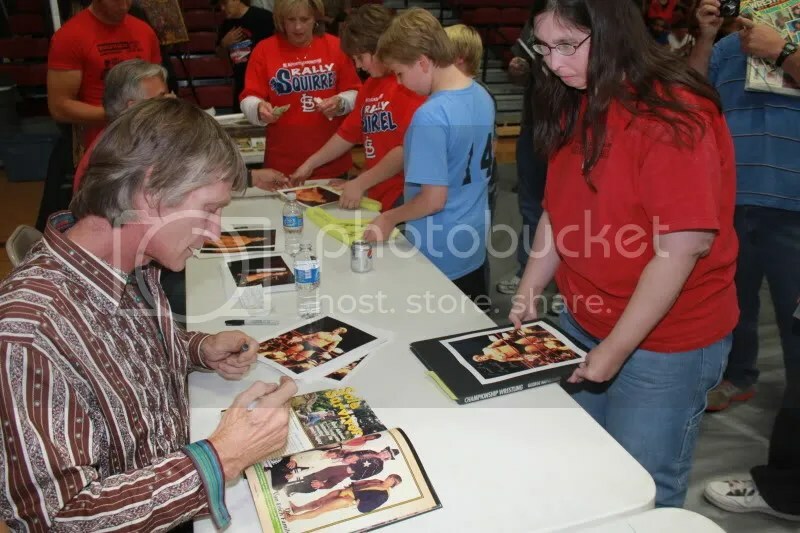 For 5 hours Kevin Von Erich signed autograph after autograph then took photo after photo. One of the nicest guys MWR has ever met. The night started off with the fans having a chance to meet the stars of WLW as well as Ricky Steamboat and Kevin Von Erich. I had the honor of meeting a true Superstar on the night when I spoke to the Cauliflower Alley Club’s Karl Lauer. He introduced me his “hero” Master Sgt Ira Scott, 87 yrs young and served in WW11, Korea and VietNam total over 30 yrs. was in the US Air Force and done everything from crew chief on fighters, to copters to bombers to medical attention in emergency and sewed up guys so would not bleed before the medics go to um. A very remarkable man and what a real hero is really all about. 5″6″ about 145 lbs and sharp as a teen ager. 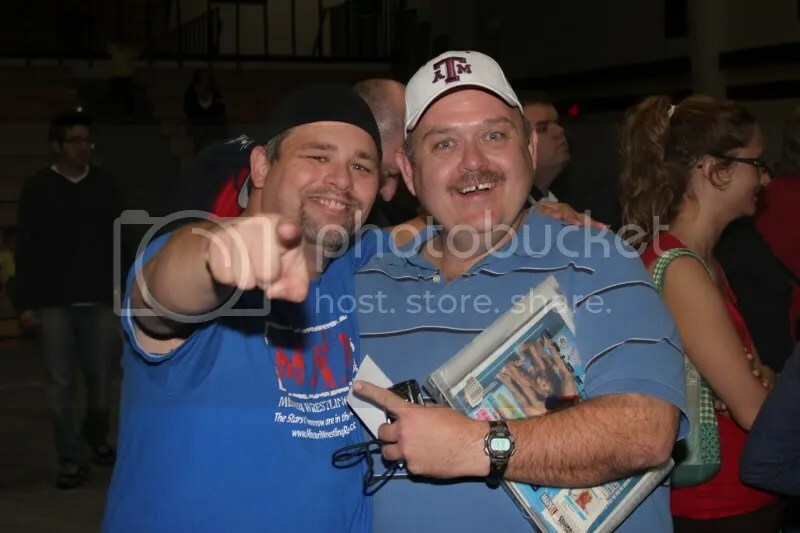 Later in the night WLW announcer Dan Gier would introduce him to the fans. Out of respect everyone in attendance gave the man a well-deserved standing ovation. As fans took the time to get their autographs and pictures taken with the stars, The personal highlight of the night for me was to have a few fans come up to introduce themselves stating that they visited the site and enjoyed it. Here I pose with a fan of MWR, a great guy who we hope to see in the matches soon. I have many friends that I know visit the site but it truly makes it worth it when I meet new friends that check MWR out so that they may know when WLW will be back in action or an interview with an up and comer. One of my very childhood best friends Billy Howser came up for the show on the night with his friend Steve. Billy showed great taste in women once again when the love bug hit him for the “Catholic Schoolgirl” Stacey O’Brien. 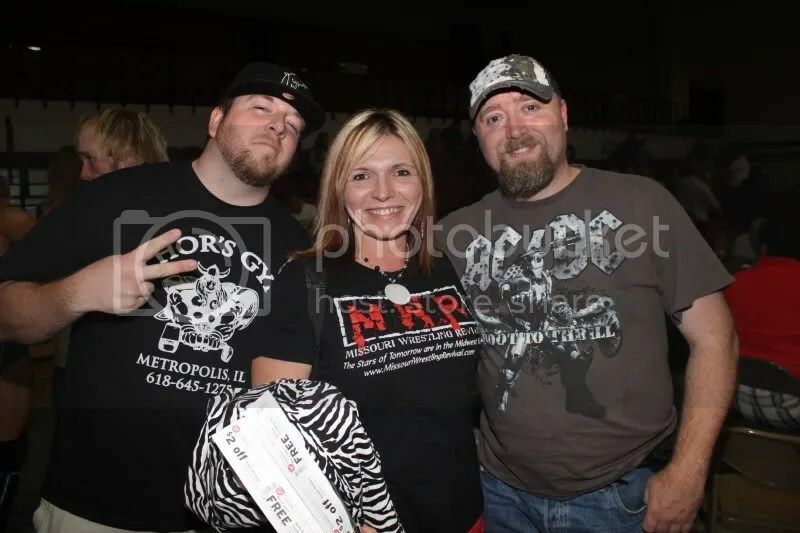 Billy bought him an 8×10 of her and wanted to know when I thought she would be at in the future as I stated that she is a star as well for Metro Pro Wrestling. As we gear up for the first ever MWR Yearbook, I have called on friends to help me add some special features for the book. One of them is famed artist ICON who work includes the world renowned painting The Gods of Thunder painting, as seen at WWE Magazine January 2011. When he told me of his newest project called “Fantasy Warfare” where he will be drawing two wrestlers from different eras going to war. The first one he did was former WWE Champion the Ultimate Warrior taking on current WWE Star and former WWE Champ Sheamus. I quickly asked to have a special one drawn for the 2011 yearbook and when he asked me who I would like to see go to battle I chose two of my very favorites of all-time, Harley Race vs. Kurt Angle. A match that I think could have won multiple awards throughout the years. Fans be sure to look for this great feature in the book to see who got the edge in this exclusive feature from ICON. 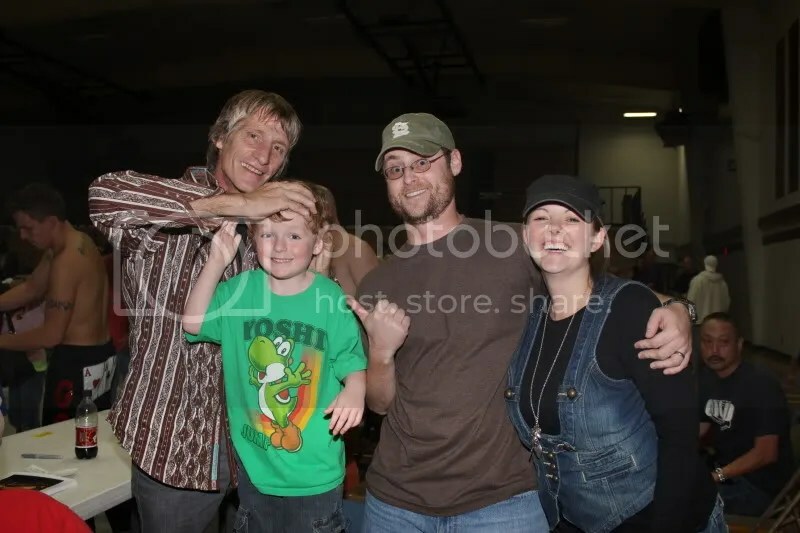 We had posted the importance of Kevin Von Erich coming to the Midwest prior to the show at MWR but little did we know how friendly the man was. All night long he posed for photos giving the fans the famed Von Erich Claw and signing autographs. One friend came up to me and was impressed on how respectful his sons Marshall and Ross were to them when they asked for a photo. Their comment, Kevin raised them kid’s right. Marshall and Ross by the way took part in the camp as they look to make a name for themselves. Their dad Kevin, proudly told me how talented they were in their high school sports during a special interview with MWR. An exciting night of action started off with one of the hottest wrestlers in the country as “The Prince” Jason Jones continued his momentum with a win against young Corey Dunken. 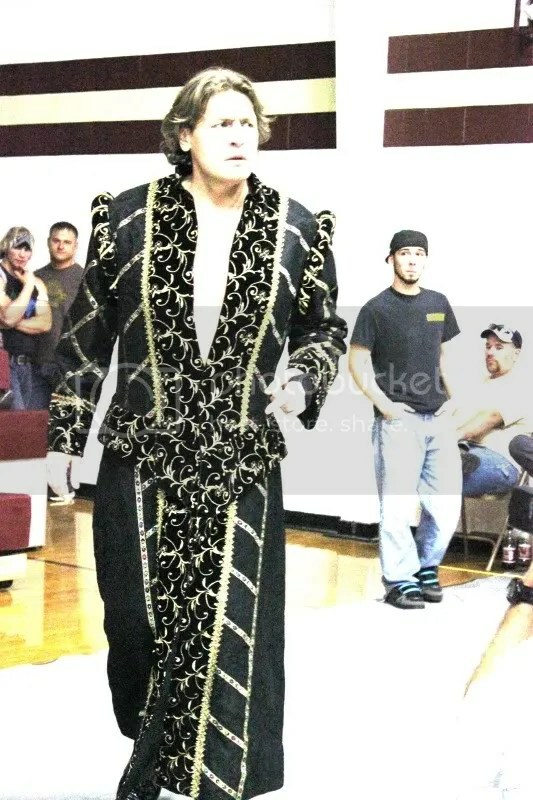 Jones would have been a real threat for the NWA JR title if he would have been able to get in the tournament for the vacated title left by former champion Craig Classic. The WLW women’s title has not been as red hot since Malia Hosaka and Brandi Alexander went to war for the championship. With Ms Natural, the most decorated champion in the company’s history back in the game the fans got to see a classic as Champion Lucy Mendez showed her heart to win a match that also featured former MWR Female of the year Stacey O’Brien. In a WLW Classic match it would be ALL THAT Matt Murphy teaming up with Steve Fender to meet Trevor Murdock and Bull Schmitt in tag action. 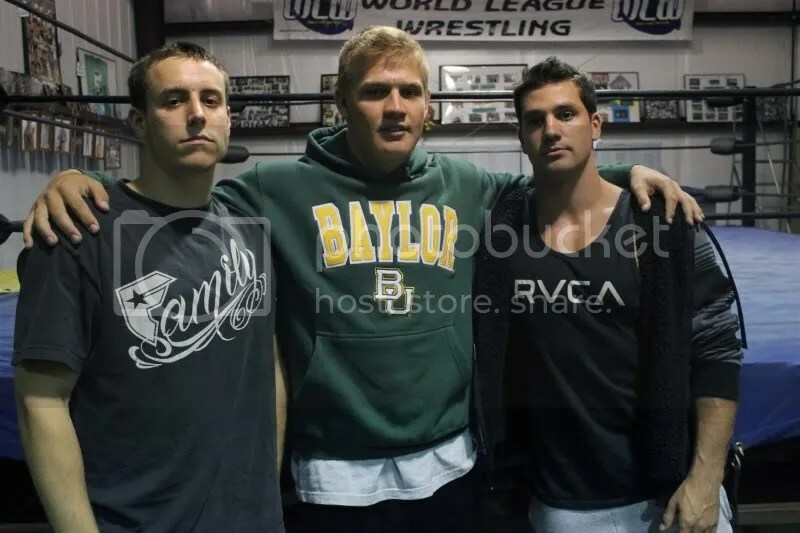 Each of these men have been able to take the skills taught to them by Race to make multiple trips to Japan and WWE in years past and their battles have always had a special place in the WLW faithful’s hearts. During the match Murphy looked to have a leg injury and would not be able to continue. It looked so bad that Ricky Steamboat who was watching in the bleachers with Ms. Natural came to ringside to assist Murphy. When out of the blue, Murphy showed his true colors and attacked Murdock and Schmitt to the shock of Steamboat and the fans. Murdock and Schmitt would be able to recover to get the win in what many fans said was one of the most special moments in WLW History. Out of respect each men hugged one another to end the match. This past spring WLW Stars Trevor Murdock and Brian Breaker toured Japan for Pro Wrestling Noah. While the two stars were on the plane tragedy struck when Hurricane Katrina exploded on Japan. The country was left in shambles and many lost loved ones during one of the saddest moments of 2011. During intermission Harley thanked his friends at Pro Wrestling Noah for their support throughout the years. In response Pro-Wrestling NOAH Ken Hirayama and Ryu Nakata spoke to the fans. They spoke about the promises of many countries to stay and help the country during the aftermath but when it came time for action many was no where to be seen, while Switzerland and the USA were front and center with support for Japan. They then thanked the fans and the country while starting a USA Chant out of respect for the men and women of the USA for their help. Back to action the man who is the current WLW Champion Brian Breaker would defend his title against fan favorite Jack Gamble. In what I thought was the match of the night, Gamble took a beating but refused to lay down to the champion Breaker. It looked as if the speed of Gamble may pay off but Breaker was just to good as his moves of crushing power was too much for Gamble. 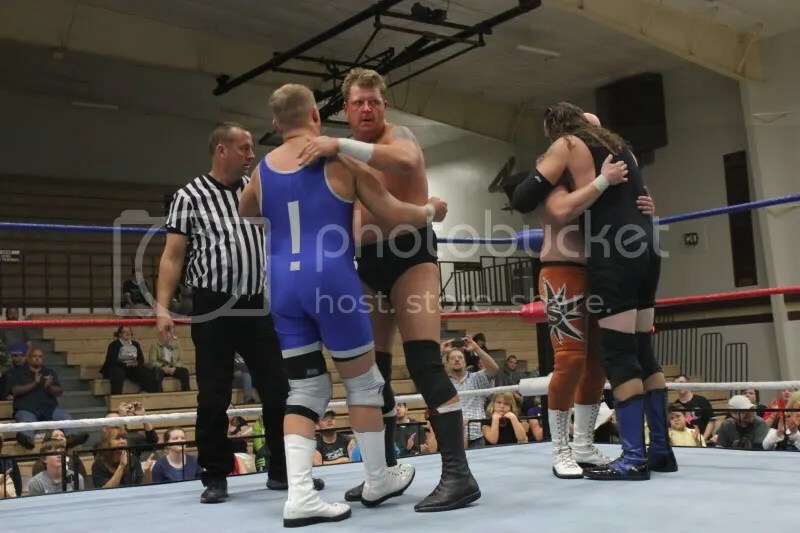 In the main event it would be a wrestling clinic as Steven Regal and Ace Steel would go old school as they traded moves and punishing blows that could have been a headlined anywhere in the country. Regal would be able to capture a hard earned win on Ace Steel to finish the nights. Once again World League Wrestling proved that they provide the fans with moments that will be cherished for a lifetime. For the aspiring wrestler , they gave them a chance to become better and be seen by WWE and Pro Wrestling Noah Scouts and for the fans a chance to meet their favorites and watch wrestling the way it was meant to be. If you missed this years event be sure to keep an eye out at MWR for info on all WLW shows and as soon as we know more about the 2012 WLW/WWE/NOAH camp we will post it here. Editor’s Note: We would like to thank Harley Race, Pro Wrestling Noah for their hospitably to bring allow us to bring you the fans this awesome look at one of the most important weeks of the year. WLW for over the past 10 years have been dedicated to giving back to communities through fundraisers of their exciting family friendly wrestling shows. Thank you to the wrestlers of WLW and the students that attended the camp for working with MWR for photos and comments for this story. Last and most importantly thank you to the fans for their support of MWR and your local wrestling promotion. Hope you enjoyed this feature and we hope to see you at the matches real soon. 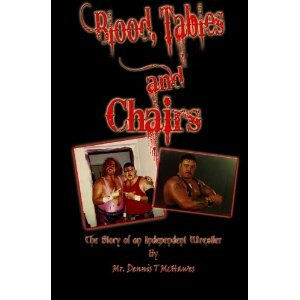 I just purchased the brand new book by Dennis T McHawes called Blood, Tables and Chairs and must admit that I could not put the book down. McHawes wrestled as one of the favorite Indy stars of the Midwest in the 90’s going by the name of the DRILL INSTRUCTOR. 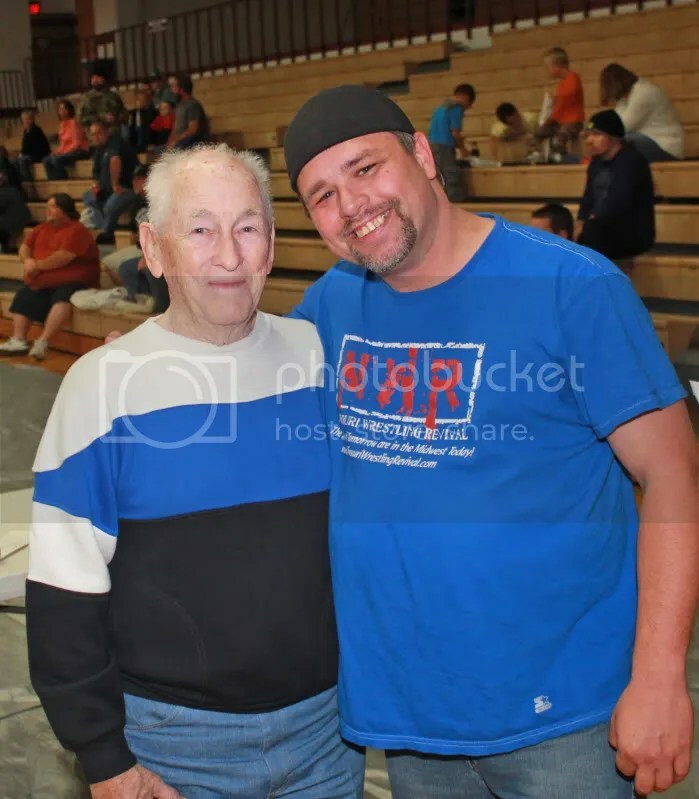 I had the chance to see him wrestle several times in Boonville, Missouri with his tag team partner Johnny Jett for a promotion that I cannot recall and recall him becoming an important member of Harley Race’s World League Wrestling. The books first words are ….. “ST Louis – The Checkerdome – 1982” and young Dennis is attending his very first wrestling match. He is excited and makes no qualms about it. McHawes does not deny that he was a fan of wrestling and because of that you find yourself cheering him on. The Drill Instructor would debut at the historic South Broadway Athletic club and Dennis goes into detail about how he went about getting his foot in the door. Throughout the book, MWR readers will recognize some of the names that he worked with. The Magic Man, Trevor Murdoch, Rick Ruby, Matt Murphy, Pete Madden, Derek Stone and Steve Fender are all included as McHawes lets us in on his ups and downs in his career. Readers will also learn that during his time with Harley Race, McHawes had the opportunity of working and partying with wrestling stars like Meng, Abdullah and even the great Harley Race himself. 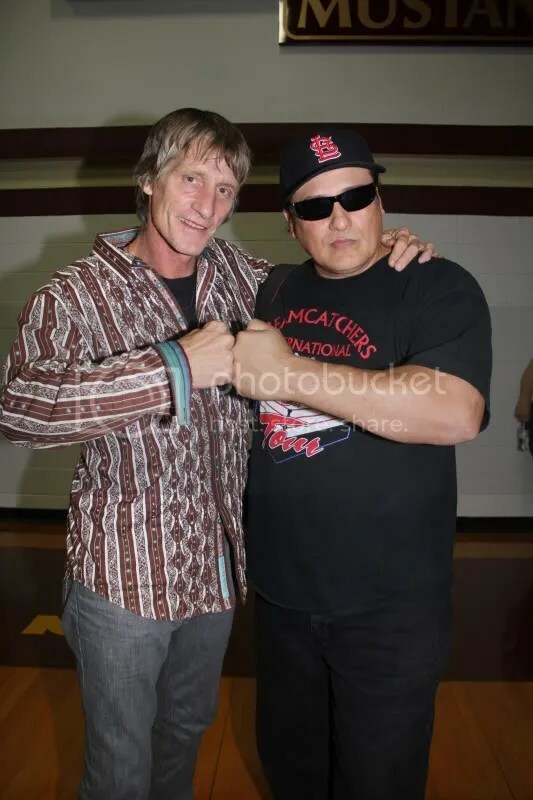 He continues to share stories of Koko B Ware and former NHL Star Tony Twist, gives a true insight of how it felt to share a dream with tag team partner and friend Johnny Jett, only to have life move them in opposite directions. You’ll learn about his opinion concerning certain promoters and what kind of advice not to take from the Iron Sheik. His trips to working for WWE marked the highlights of this book for me. He lets his guard down for the readers, who are therefore able to truly feel how much he and other wrestlers wanted to impress. You will also not want to miss his reflection on his relationship with Race. Most of us never get to work so closely and become friends with one of the greats. In all walks of life, you have friendships that have highs and lows. In the end you can really get a feel for how thankful McHawes is towards the people who helped him. With World League Wrestling’s 10th anniversary event just a couple weeks away, I’m sure I’m not the only old-timer whose mind keeps wandering back to the beginning a decade ago. 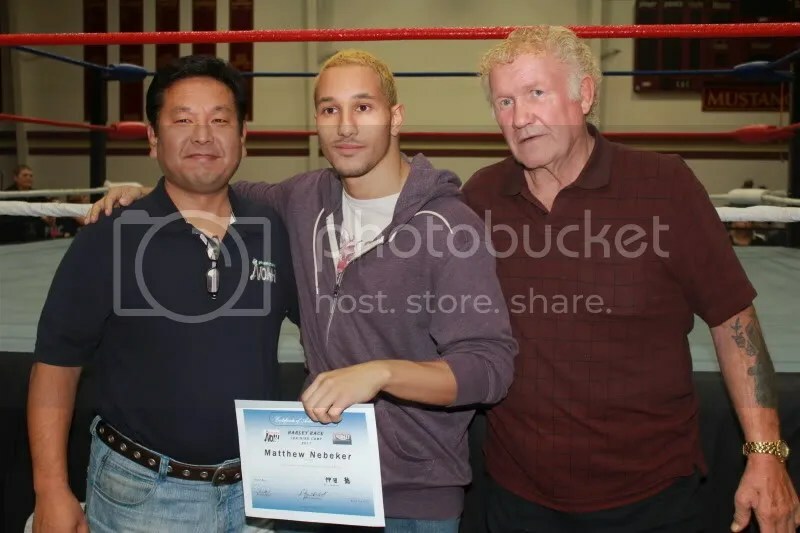 In July 1999, the Harley Race Wrestling Academy began holding tryouts and classes at Lewis Boxing Gym. It was a small space crammed in along a line of old brick buildings in a bad neighborhood in Springfield, Mo. There was no air conditioning and it reeked of weed, the severity dependent upon which Lewis brother was in the office. The boxing ring was manufactured in the depths of hell and sent to Springfield to punish me for my future transgressions. There were six of us then: I was the first full-time student; Trevor Rhodes (Murdoch) came a week later along with his brother, independent veteran Johnny D; and the trainers were Derek Stone, Griz, and referee Skippy Johnson. We lived together in a small two-bedroom house and trained between six and eight hours every day. Meanwhile, Harley and Dave Marquez built World League Wrestling from the ashes of World Legion Wrestling, a promotion I watched on syndicated television that had featured Sid Vicious, Big Sky (Tyler Mane, who played Sabertooth in X-Men, Michael Myers in the new Halloween, and the oil driller who beat up the lead character and then caught fire in Joe Dirt), “Atomic Dogg” Steve Sharp, Luminous Warrior, and the champ, “Sheik” Derek Stone. After Marquez and the trainers traveled to Lake of the Ozarks to meet with Harley, Derek announced that the school was moving to Eldon. “Where?” I asked, still half-asleep on the couch. Eldon, for those who’ve never been there, is not much different from every other small town in Missouri: a little backward at times, a little boring at times, but really not a bad place to live. Its population is between 4,000 and 5,000 and rent is cheap enough. We were local celebrities when we first moved to Eldon, making personal appearances and doing radio and newspaper interviews regularly. And we were all with Harley Race, so if a half-dozen gorillas walking into a restaurant didn’t get their attention then Harley’s presence did. I’ll never forget the first World League Wrestling event, held during a middle-school assembly Sept. 24, 1999 in Caledonia, Mo. Griz and I squared off in the main event and, due to ring announcer Steve Murphy’s claim that I was a “19-year-old rookie sensation making his professional wrestling debut” (I was 20 and I’d had three matches for East Coast promotions prior to training with Harley, so it was just a small fib), the crowd loved me. The three-match afternoon event was held during school hours with hopes that the kids would go home and beg their parents to bring them back for the full evening show. It was a flop: we had a crowd of about 60 that night. We had some solid guys back then. Derek Stone was one of the best workers who never had a contract with a national promotion. Griz and “Tiger” Treach Phillips, Jr. were two solid veterans and great assets to their young opponents like me and Trevor. We really didn’t have a weak link on the card. We had other veterans like Johnny Jett, the Drill Instructor, Nasty Bill, Blade Boudreaux, Lance Jade (that’s not a typo, and Jade also had a contract with WWE for a year or two), Malia Hosaka, Brandy Alexander, T.S. Aggressor, Mr. Destiny, Johnny D, and Luminous Warrior. I always wanted to do two things with my life: become a professional wrestler and make a positive impact on others. 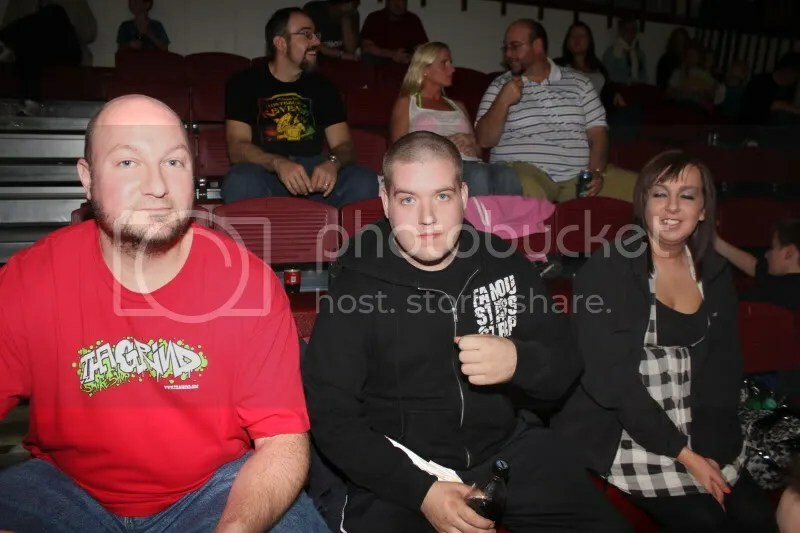 Within seven months of our first show, we were wrestling every weekend, usually doing two or three fundraising events. 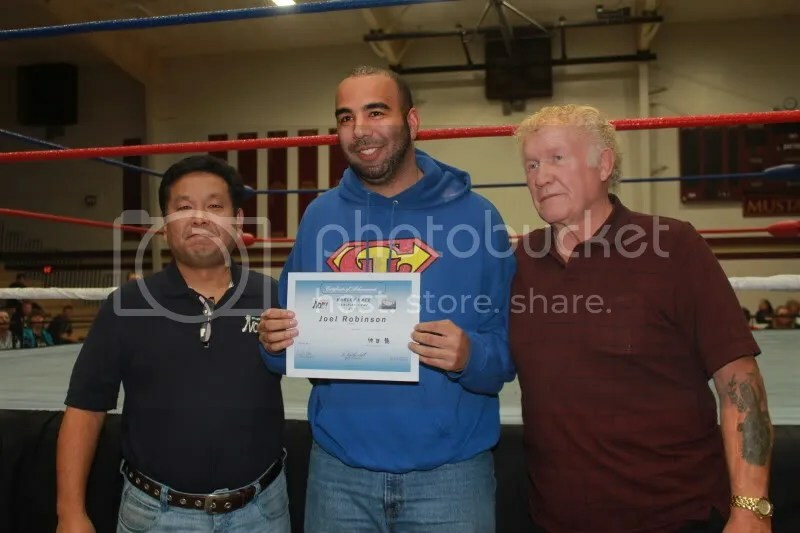 I was living my dream as a professional wrestler and I was part of a group that helped countless non-profit organizations raise funds to make the world a better place. Maybe I shouldn’t have asked for more, but I did. Like every wrestler, I dreamed of becoming a WWE Superstar. I didn’t make it because I made stupid choices and didn’t earn it. I spent too much time dreaming and not enough time working. But when Trevor Murdoch, who I grew up in the business beside, called me to tell me he signed with WWE, I felt the same inexplainable feeling of pride that I imagined when I used to sit around dreaming about getting a contract with WWE myself. When his first vignette aired on Monday Night Raw, I was thrilled. I sat on the edge of my seat during his debut match. While my dream, as I envisioned it, never came to fruition, I got to go along for the ride while one of the best friends I’ve ever known lived out our dream. That was all the satisfaction I needed. Times have certainly changed in the past 10 years. WLW talent, other promotions, and crowds have come and gone. Trevor and I were two boys in a locker room full of men, both living our dreams. Now, we’re two old-timers, sitting on the porch talking marriage and fatherhood and barbecue grills. Still, the olden days seem to find their way into most of our conversations. In the earlier years, there seemed to be more children in the crowd. Many of the kids who were my biggest fans a decade ago have become adults. Some of them still remember me and others seem to have forgotten me. Some still smile when they see me and others seem to resent me. I’d guess it’s because I was somebody they saw as larger-than-life—as a star—when they were kids and now they feel duped when they see me grocery-shopping with my family. 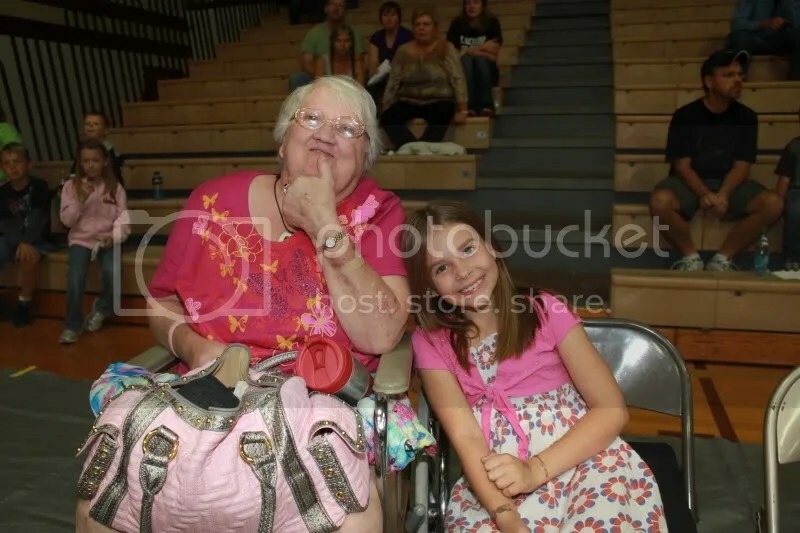 The last time we performed at the Eldon High School gymnasium was one of our greatest events. It was in late-April 2000, with WCW stars Meng and Disco Inferno as the special guests. 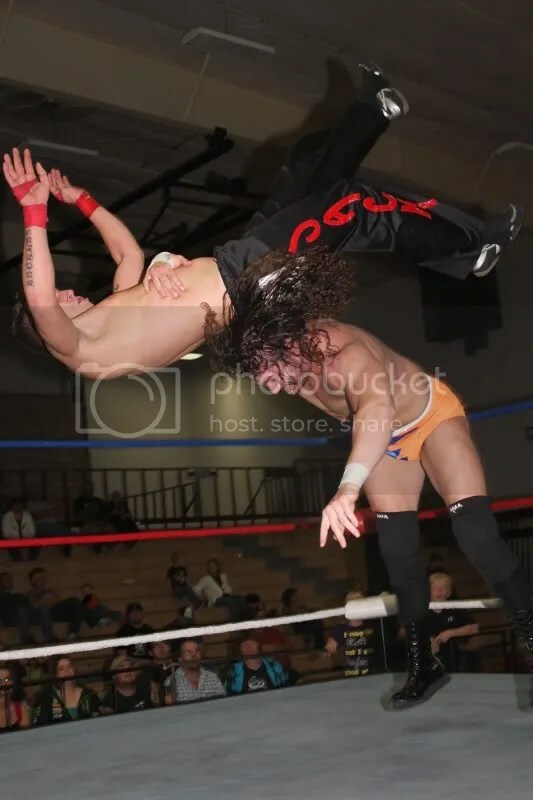 Disco Inferno pinned me that night in a singles match and then my team beat his in an eight-man tag match later that night. In the main event, Meng lost the WLW Heavyweight Championship to Trevor (with an assist from me). It was our first great event and still one of the best WLW events ever. It’s appropriate that WLW will celebrate its 10th anniversary by returning to the gym. I wish I had the desire, if not physical ability, to get back into the ring one last time for the anniversary event, but I’m proud the worker I became and I wouldn’t dream of getting into the ring at a level below that. Since my in-ring career ended, I’ve worked with WLW off-and-on in various roles. While I’ve had my ups and downs with WLW, they will always be family. Congratulations, World League Wrestling, on ten years of bringing exciting, family-friendly entertainment to Small Town, Missouri for good causes. Thank you for giving dreamers a place to learn and practice their chosen trade as they pursue stardom. You will not want to miss the opportunity to support 10 years anniversary on October 3rd. Along with the current Superstars of WLW, fans will be able to meet former greats Bret “The Hitman” Hart, Akio Saito, Bob Geigel, Betty Nicoli, Bill Kersten, Mike George, Roger Kirby and of course the greatest of them all Harley Race. Luke, you have been in the business now for 18 years. How did you go about it and what did your family think about this decision? 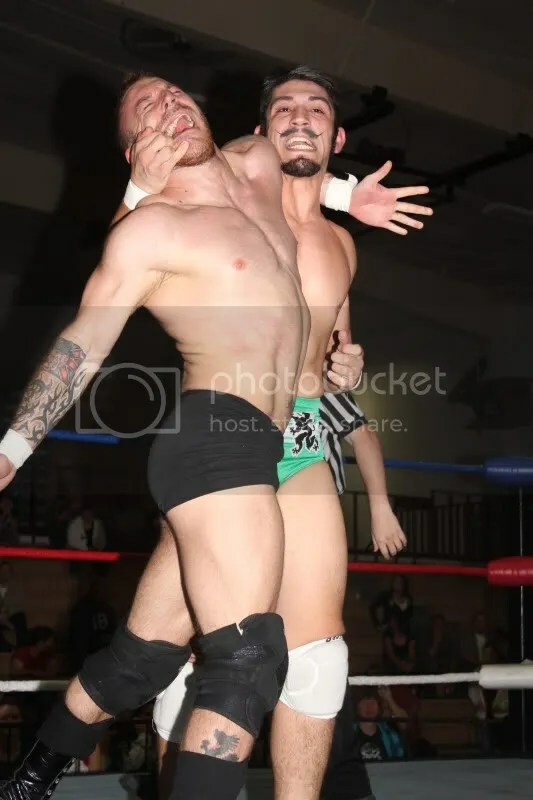 As far as getting into the wrestling business, I was very fortunate that my brother had been wrestling at South Broadway for a couple of years prior to my in-ring debut. Many people said that there was no way I would survive, let alone succeed in professional wrestling. Typically, as brothers are, my brother loved the idea of being able to beat on his brother and get paid for it. My father thought that it would be a good way to toughen me up. My mom was scared to say the least. What were your first roles in the business? My first roles in wrestling were very challenging. I was in charge of playing entrance music for the wrestlers. I helped with printing and story ideas for the South Broadway program. I ran jackets and things back to the locker rooms. Even at an early age, I pretty much had to know a large amount about professional wrestling. Who in the business has been the most instrumental in your success? Well, I can honestly say that several people were instrumental in getting me to where I am today. 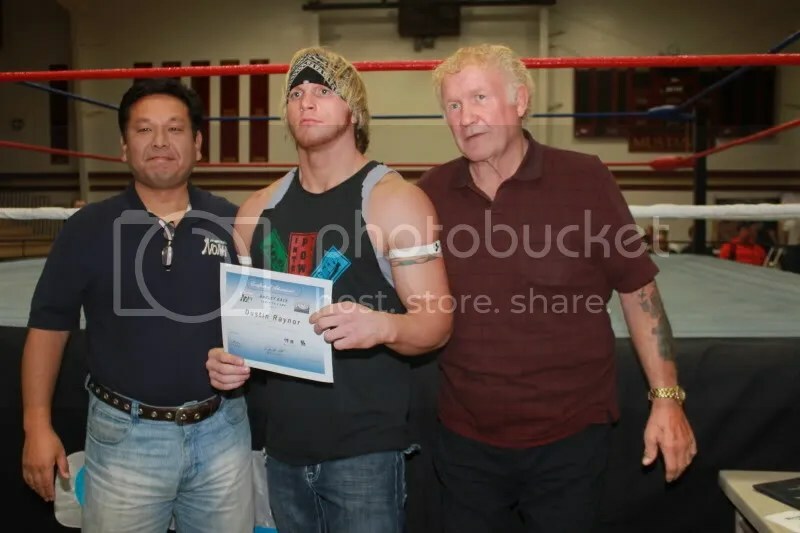 My trainers, Billy Bob, John Blackheart and “The Human Wrecking Ball” Pete Madden were very instrumental in getting my mind into pro wrestling. They showed me not only the flash and the glitz of wrestling, but how to protect yourself at the same time. As a referee, I would have to say that the most instrumental in my career would have to go to Butch Fletcher. 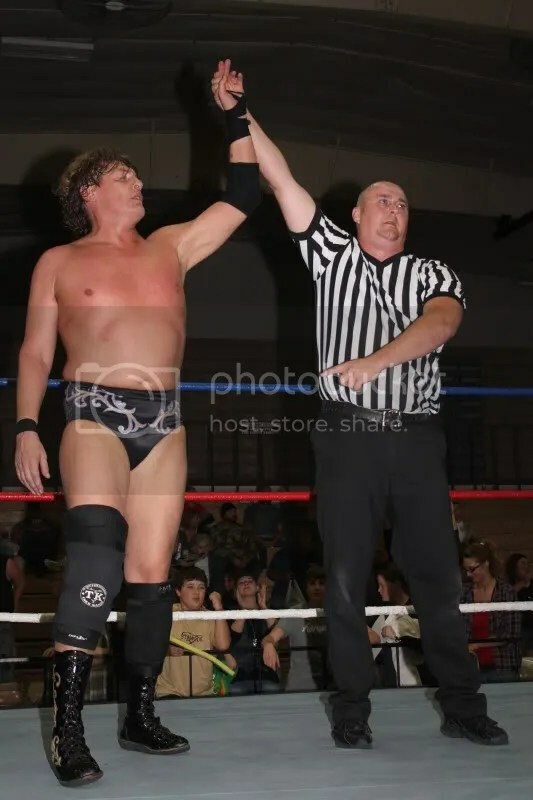 He knew me from my days as a wrestler, knew my heart was definitely into wrestling, and asked me to referee for him. The rest is history. What has surprised you the most about wrestling in general? What has surprised me the most about wrestling is the “who you know” mentality of a lot of pro wrestlers. There are many wrestlers who get overshadowed by those who don’t deserve to be involved in the spotlight. I know several great wrestlers who have had to leave wrestling because they could not get their fair chance. At an early point of your life, who in “The Big Show” did you look up to? Being in the business for so long, did you ever meet that person and what were your thoughts afterwards? As a young child, my brother and I were huge into wrestling. I really liked Harley Race. At first, I could not explain why I liked him other than my brother and my dad did, so I guessed I should, too. After a couple of years of being involved in wrestling, I wrestled on a show for the Mississippi Valley Wrestling Alliance. The main event was the crowning of the MVWA Missouri State Champion. 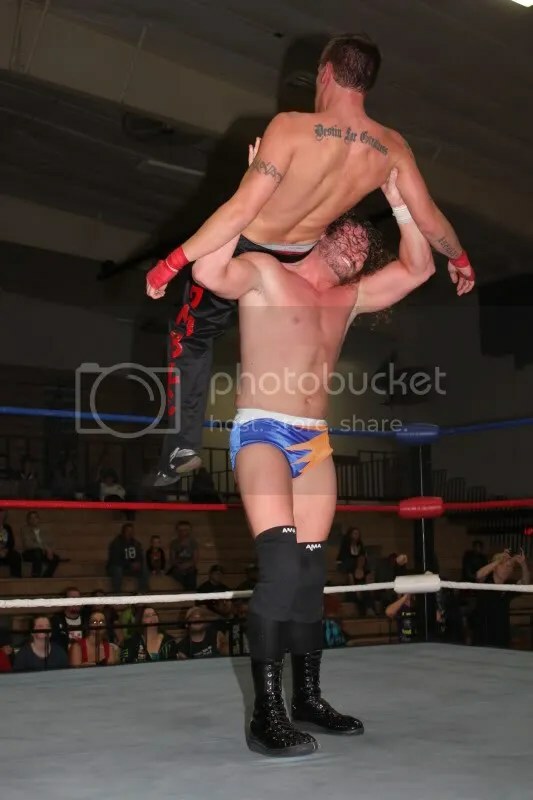 The match was between Derek Stone and Ace Steel. Harley was going to present the belt to the winner. 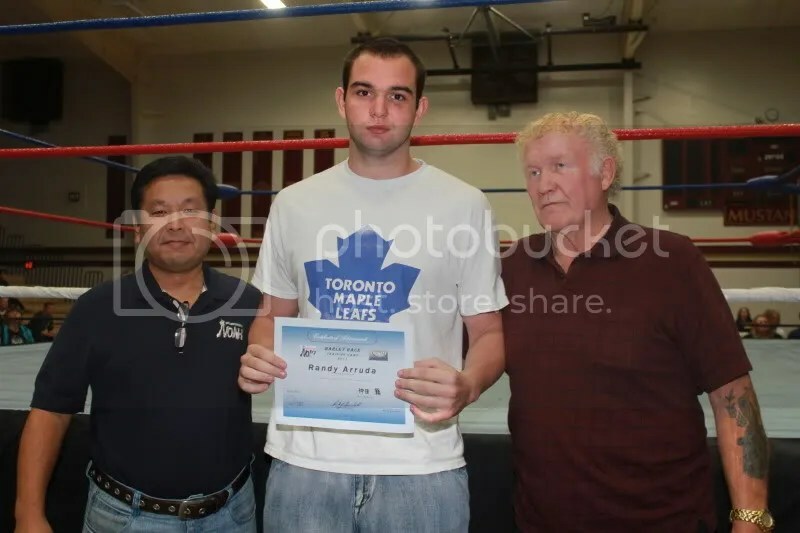 I was a nervous wreck before my tag team Lemay Street Fight. Just talking to him, I learned so much and became much more relaxed. I really wish that I could have had more time to talk with him. He is one of the classiest people I have ever met in professional wrestling. Your reply may be lengthy, but it is very important. Give us the history of pro wrestling in St. Louis over the past 18 years in the eyes of Luke Roberts. The St. Louis professional wrestling scene has changed so much in the last twenty years that you would swear there is no way that St. Louis survived with only one promotion in town. In the late 1980’s and early 1990’s, South Broadway was the “only game in town” yet the wrestlers were top notch. The main “bad guy” was the Giant Assassin. He was managed by Big Daddy. These two were able to lift a finger and almost incite riots. On a monthly basis, they would consistently wrestle wrestlers like Ron Powers, Ed Smith, Gary Jackson, and a host of others. There was no one who could take them down. They were the “in crowd” at South Broadway. People wanted to be seen with these two people. They were almost, at times, like rock stars. The light heavyweight scene was unmatched. With a roster like Keith Smith, Chaz Wesson, Pete Madden, Danny Boy, John Blackheart, Johnny Jett and others, they consistently tore the house down every month. In the mid 1990’s, the scene changed with the emergence of companies like the Interstate Wrestling Alliance (IWA), Central States Wrestling Alliance (CSWA), and Central Championship Wrestling (CCW). Out of this group, CSWA turned into Rampage Championship Wrestling (RCW). The IWA changed on the business side of the company and became the Mississippi Valley Wrestling Alliance (MVWA). As the late 1990’s approached, a lot of the “trend setting” was being done by Midwest Renegade Wrestling (MRW). Most of today’s fans would know that MRW morphed into the wrestling juggernaut that became Gateway Championship Wrestling (GCW). Until GCW came around, no one single company had the power to challenge South Broadway. Once a company could show that they could challenge them for the top spot, it seemed like companies were coming out of the woodwork. If it weren’t for GCW, companies like the UWA and LWA may not have materialized to become the companies that they are today. You have been a referee, wrestler, ring announcer and commentator among other things in the business. Which facet do you prefer and why? If I had to choose one, I would say that I enjoy refereeing the most. At 31, it still gives me the adrenaline rush that wrestling did, but without a lot of the bumps and bruises that come with it. Refereeing also keeps you mentally “on your toes” at all times. Who in your mind is the best ever in the positions you have worked with and why? It is really hard for me to limit it to one on this question. I would say that there have been three referees that really stand out to me. One referee that stands out to me is Bama Bodine. This guy was about five feet tall and weighed about 100 pounds. He was the tiny referee that everyone tried to push around, but was always able to put you right in your place. The second one would be Butch Fletcher. In his day, he was always able to be in the right place to where he would be refereeing a match, but you would never know he was there. The last referee is Michael Crase. As far as referees today go, he is the best in St. Louis. Every time I refereed a show, I hoped that he would be there. If he wanted to be, I feel that he has the skills to referee for any of the major companies if he chose to do so. I would say that the best announcer that I have worked with would have to be Dr. Love in the LWA. His work is acceptable. His energy, however, is unmatched. I try my best to match his level of energy and, to this day, I have not found a way to match it. Frank Reed always seems to know something about everyone. He can take one piece of information about a wrestler and weave it together to where you would think that he has known the person for years. Frank always thinks on his feet and that’s what makes him so good. What are your thoughts on Jeremy Borash? I feel that he brings a lot to the table in terms of what he can do for a wrestling company. He seems like he can do almost anything. I try to model and compare a lot of how I do things to him. Have you ever been asked to be a part of an angle that you refused or afterwards regretted? Early in my career, nothing was out of my realm. I was willing to do anything to make people hate me. Today, I am a little more limited and reserved with what I do. Any good road stories that come to mind? My first road trip to Chicago was great. Billy Bob, Mark K. Fabe and I wrestled in St. Charles on a Saturday night. We drove almost all night to get to Chicago. We were told to take a particular exit to our hotel. When we got to the exit, we remembered hearing something about road construction by our hotel. We figured that we could just go to the next exit, turn around, and backtrack to our hotel. Needless to say, our five minute detour cost us almost an hour and a half. Then, going on about two hours of sleep and a lot of soda, I tried to take a shower. By this time, a wrestler known as the Beast charged through the door, scaring me half to death. I have never been the same since. Once I finally got of the shower, I heard a ton of noise and the phone ringing. Apparently, two other wrestlers wanted Mark Fabe to wake up. So, in typical wrestler fashion, they start throwing standing moonsaults on the bed until he woke up. Finally, we met up with several of the other wrestlers from the show for breakfast. One of the wrestlers, Matt Taylor, was feeling really bad from too much partying the night before. We all started talking about what we wanted to eat, he turns as green as a piece of grass, runs screaming across the restaurant, hurdling tables as he went to the restroom. The show was horrible, but getting to the show was a blast. Another good road story happened a couple of years ago after a UWA show. Scott Murphy and I were coming home from a show. We stopped at a McDonald’s with Scott’s wife and a friend of ours. Scott was being loud, which for him is not that difficult. We all try to get him to quiet down. I had to go to the restroom. I realized on my way there that there were two on-duty police officers at the McDonald’s as well. So, on the way back, I told Scott that we needed to go before the police arrested him. He did not believe me until we were leaving and he saw them follow us out of the McDonald’s. Then, the officers followed us for almost a half mile before they turned down another road. Scott has always said that he was not scared, but I could tell that Scott got a little more than he bargained for. Wrestling fans never seem to get enough of stories of guys ribbing each other, how do you feel about them and would you care to share some? Ribbing other wrestlers is a staple of professional wrestling. Many professional wrestlers are like the class clowns from junior high school. Ribs definitely make things much more fun. Some of the ribs that I have seen include completely wrapping a wrestler’s bag in duct tape, hiding people’s clothes throughout the building, and putting an inappropriate bumper sticker on someone else’s car. The best rib that I was a part of was on the way to a show in Cahokia, Illinois. We told one of the younger wrestlers that we were going to play tag. He got out of my car and tagged another wrestler’s car. While he was doing this, the light changed, and we left the guy standing in the middle of the road. We watched him as he begged for a ride to the show. It was priceless. So, the other wrestler lets him get in the car. When we came to the next stop light, the guy pulls the exact same trick on the guy, but manages to have the wrestlers actions seen by a Cahokia policeman. We all played it off like the officer was going to come and arrest him. We clued the officer in on the joke and he worked with us. The officer asked for this guy to come talk to him. He was scared to death. After asking him several questions in a serious tone, we let him in on the joke. It was the best rib I have ever have been a part of. In what ways could pro wrestling in St Louis improve? Honestly, I think that there are a lot of ways that professional wrestling in St. Louis can improve. Wrestlers need to be given the opportunity to train freely and learn from a variety of different wrestlers to become better wrestlers and make an impact on professional wrestling. Not only can wrestlers learn more from a variety of different styles, they can learn from the history of professional wrestling to make the sport better. What are the common mistakes that independent promotions make while trying to draw a crowd? 1) Companies do not have people dedicated to advertising the event. I have seen companies wait until the day of the show and try to hand out flyers, hope that they will draw a crowd based on one poster in the venue, or solely base their advertisements to the Internet. I feel that companies like MMWA, GCW, and LWA have made it a point to focus on a multi-tiered advertisement system. The MMWA has their event posters out a couple of days after their most recent event, promote their shows on their website, and advertise their show dates on their television program. When they were in operation, GCW always made it a point to not only promote their shows online, but they would also be seen at events with flyers promoting their upcoming shows. LWA has done television ads, online promotion, posters, and flyers to advertise. If you are going to be a legitimate company, you need to focus on promotion. 2) Don’t force feed a particular wrestler onto a crowd. If a company chooses to cram a wrestler or a faction down the throats of wrestling fans, make sure that the wrestler can keep it original. Too many wrestlers, managers, etc. give the fans the same lines at the same place every month. You have to keep it fresh or you burn out people on professional wrestling. 3) Putting people in a wrestling ring before they have been “trained”. I have seen way too many people that think that they can be a professional wrestler just because they are well built. I spent three years training in a ring every week learning the various aspects of professional wrestling before I had my first match. Granted, I may not have been the best wrestler, referee, manager, or ring announcer, but I was willing to work at things at take constructive criticism. Today, if you say one thing that a wrestler does not like, it becomes a personal attack on that wrestler. The only way wrestlers get better is through training and experience. Wrestlers need to check the egos at the door. There are many times when I, even with my experience, ask people for advice. If you want to be an egomaniac, hit the door and get out of professional wrestling. You are taking up spaces for those that actually care about professional wrestling. One question that is often brought is advertising of events. I keep up with shows via websites such as Missouri Wrestling Revival (www.missouriwrestlingrevival.com) and the St.
Louis Wrestling Community (http://stlwrestling.livejournal.com). What are the most successful forms of advertising a show and can one start too early? Advertisement is vital to any professional wrestling event. You need to start advertising as soon as possible for the event. I would say that television is probably the best way, but it is not easy to obtain time on television. The best way to advertise for a show is to get as much information out as possible to inform as many people as possible. Flyers, posters, and the Internet will not individually equal success, yet a combination of these types of promotion is necessary for a professional wrestling company to survive. Where is the best location, at the moment, for shows? As far as crowd size is concerned, the South Broadway Athletic Club is the best location for professional wrestling events. The people, however, don’t always go for the wrestling. Many of the people that go there go to meet friends and have a few cheap cold beverages. However, as far as wrestling is concerned, the Knights of Columbus Hall in House Springs, Missouri is the best location for wrestling shows. The fans let you know what they want and always seem to have a great time every time professional wrestling comes to town. How long should a show last and how many matches are needed? I feel that a professional wrestling show should be around 2 ½ hours in length. You can have six to seven matches to grab the attention of the audience, provide every wrestling fan something that they want to see, and send everyone home happy. Fans want to go to wrestling shows that have what they want to see on a regular basis. If you were to book a style of wrestling that could put fans in the seats, which one would you target that you would be most comfortable running? If I had the opportunity to run my own wrestling show, I would have to say that I would like to focus my promotion around the philosophy of the late Sam Muchnick and the NWA of the 1960’s and 1970’s. I feel that you need an opening match with an individual that a wrestling fan can consistently associate with and get behind with little motivation. Wrestling matches need to keep the action going while keeping the fans on the edge of their seats. What is your take on wrestling promos and interviews during independent shows? Interviews and promos during independent shows need to be limited to, at most, one per show. An interview only needs to be conducted to promote an upcoming match or to give focus to a big feud in a promotion. Promos should only be used when a promotion wants to bring fans up to speed on a new feud or a new wrestler entering the promotion. I have been involved with companies where the same wrestler had to have an interview or a promo on every show. In the beginning, the fans hated the wrestler. As time went on, wrestling fans and wrestlers alike began to sour on the promotion. Promos and interviews, when used wisely, are a great tool. In the wrong situation, a promo or interview can ruin a promotion. True or False: An 80’s WWE star will outdraw a current TNA star in St. Louis? False. I think that the opinion of the casual wrestling fan is changing. I have been on wrestling events with both WWE and TNA wrestlers. The majority of the fans connect wrestling to what is on television right now. Some people will naturally take the trip down memory lane, but most people want to see the wrestlers that they can see on a regular basis. What current or former stars were the most down to earth? 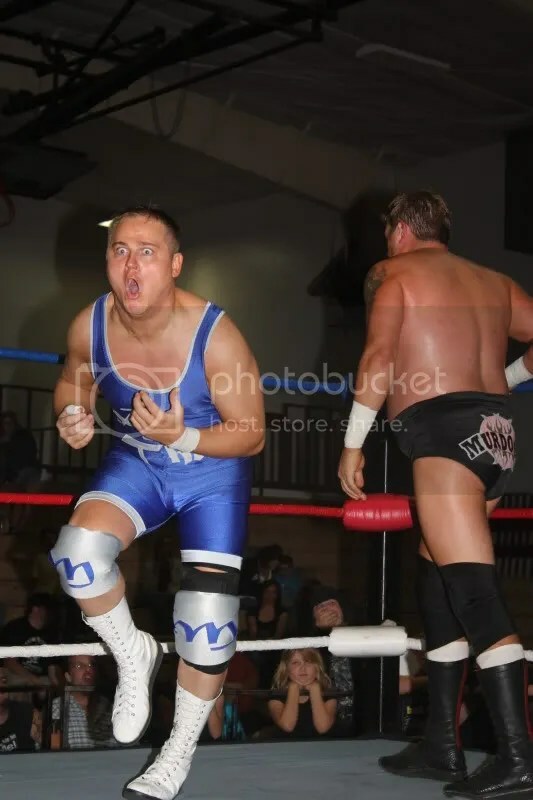 Out of all of the wrestlers that I have worked with, I would say that Ace Steel, Mike Quackenbush, Samoa Joe, Davey Richards, and Harley Race have been extremely humble. I genuinely felt that these people would be the same whether they were at a wrestling event or walking down the street. Which ones did you felt thought highly of themselves? I haven’t really met anyone on a national level that thought extremely highly of themselves. What are your thoughts on Internet wrestling fans and what kind of impact do they have? At times, I have felt that Internet wrestling fans have been a blessing and a curse to the world of professional wrestling. The Internet provides wrestling fans an opportunity to follow their favorite promotion or wrestler. However, the Internet allows fans to think that they know everything about professional wrestling. 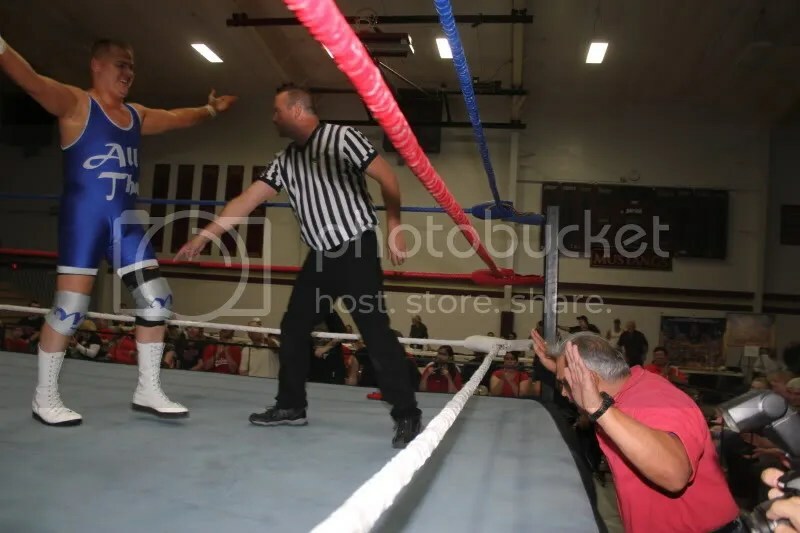 To me, if you have not been in a wrestling ring, you should not be giving advice, comments, or critiques of what goes on between the ring ropes. I am always more than willing to talk to any wrestling fan about what they have seen or about the history of professional wrestling. However, if you want to think that you know more or can be better than the wrestlers in the ring and you are not willing to make the sacrifices that wrestlers do, then don’t even open your mouth. Editors Note: Part 2 of this interesting and insightful edition of MWR Spotlight will be published in the next few days. I want to thank Luke Roberts for being kind enough to give us a little of his time, and encourage those who would like to be spotlighted, profiled, or interviewed by Missouri Wrestling Revival to contact me.